Look for Manufacturers Marks, finding the mark eases the identity. 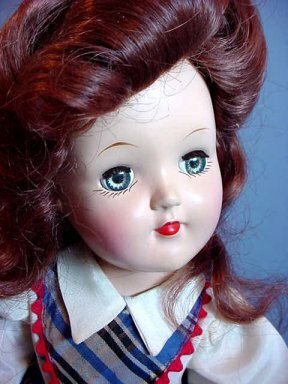 Over the years this doll site has been online, the majority of questions relate to antique doll identities, value, and disposition. Near the bottom of this page - scowl down about halfway - there is a form you can fill out to share your doll interests with others, along with pictures. The identity of a doll is the most critical factor when determining value and options for disposition. 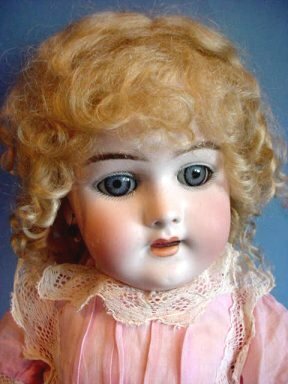 Many seasoned antique doll collectors, through experience, can tell the identity of a doll and many times the value, by the height of the doll, the materials the doll is made of and the shape of its head - other minor details figure in as well. Recognition of an antique doll is indeed an art form! C. Worse yet! You are a husband suddenly faced with a room full of dolls that need to be placed with new owners. If this is you - the question comes to mind where do I begin? Do I buy books? Consult friends and neighbors? Seek out an appraiser? Spend time in an Antique Mall? Or surf the internet? Friends and neighbors - probably not going to be much help. Antique Malls - time-consuming and very limited. Books - expensive, time consuming, and often times a little confusing. 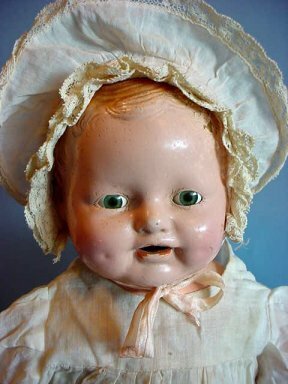 Probably the best resource for antique doll identification is the internet. The internet provides an abundance of information about dolls, all kinds of dolls. It can be time-consuming, yet cost-effective. Before searching the internet for a doll id, you will need to know several things about the doll. The main item of interest is the manufacturers' mark. Many of the earlier doll manufacturers marked the bodies with a name or a number or combination name and number or combination number and letters - many marks have been cataloged on the internet. Manufacturers marks can be found on the head or neck, between the shoulder blades or on the feet. Also, some original doll clothing will have tags hidden undergarments. Many hard plastic dolls are marked clearly although some may have no markings at all. 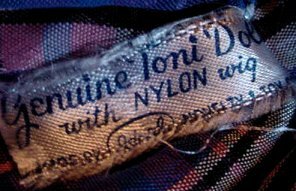 A collector's delight is Ideal's Toni doll. She is well marked on the base of the head and across her shoulders. Occasionally the leg and arm joints will have the size attributed to this particular doll. P-90 is the 14" doll. P-91 the 16". 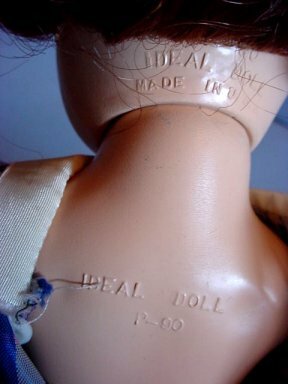 This girl is marked: P-90, Ideal Doll, Made in USA on the back of neck. Also marked: Ideal Doll, P-90 between shoulders. A doll in her original dress may have the cloth tag attached to the garment. This is not true of all original dresses........as they were children's toys.....and they cut the tags off as you would in a dress that an adult would purchase for themselves. Recent sales on eBay of 106 listings sold of Ideal Toni dolls show a price range of $0.01 to $100.00, the average price being $17.47. This beautiful doll created by Heinrich Handwerck with mold number 109 is clearly marked on the back of the head under her hair. 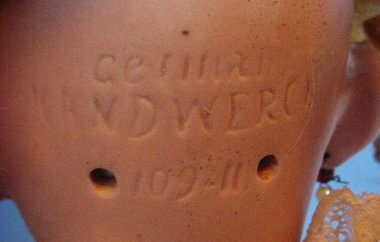 Handwerck often stamped the body on lower back or hip in red. This is not the case with this particular doll. Dolls with kid bodies may occasionally have the manufacturer marks hidden under the kid leather which covers the shoulder plate. The above doll is made of Bisque and recent sales on eBay of 343 listings sold, show a price range of $0.01 to $800.00, the average price being $43. 08. Of course, not all Bisque dolls are Heinrich-Handwerck dolls -- and condition of the higher valued dolls is critical. Are they complete body wise and undamaged, do they have their original clothing and is the clothing nice? The markings found on the back shoulders of this sweet composition baby are very clear. 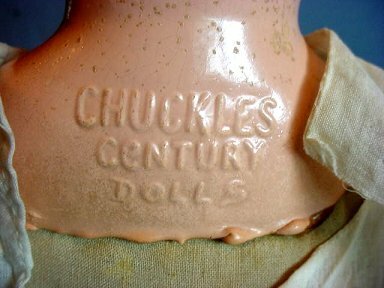 Her name is "Chuckles," and the manufacturer was Century Dolls. These marks should give you enough information to browse ebay or price guides to acquire information regarding her value. Manufacturer and era and the background of the doll - where it came from (original owner), an interesting story sometimes helps in the value of a doll. How tall is the doll, height seems to be an essential factor now, along with the condition? The best online source for doll identification is doll reference.com here you will find a good sized list of manufacturers marks along with pictures and descriptions. Hello we have a 24" precious princess 0522/2500 how do we determine the value and maker? Received from a friend. Can you tell what date? Era? Etc... She is 3” tall Thank you! Does anyone have any info on this vintage cutie? Havea doll with cloth bodyand wooden painted head..it is jointed and says E.G. on back of neck, is stuffed with what looks like straw. Any ideas? This beautiful doll has no markings and a stuffed body any ideals? Mysterious doll who made it? Purchased recently, cant identify maker, age, country of origin. grandmothers bisque doll- words on head: 1909 dep r3a who was the maker? thank you ! Antique, jointed, bisque German(? doll? Help appreciated. She is approximately 38 inches tall and we cannot find any marks on her. Bisque face? Thanks. I need help finding parts for my Ideal doll marked G 17. These pictures should be with the new live page along with the description. Please help me identify this composition doll! Thanks! Who made this strange doll and when?? 1950s Dolls of Italian Make?? Porcelain doll with no identification markers, help please? Lilly - Made In Italy - with original box. Need help identifying this china head doll. My grandmother had this doll put away in her attic, I now keep her displayed in my china hutch. Anyone Know who made this doll?what is she made of?How old. Thank You. Can not find out much about this doll maker can you help me. Names of Dolls of All Nations from 1940s? Please help me identify this antique doll! This doll was given to me when I was very young. I do not believe that it has any markings on it. Could anyone tell me who makes it, etc? Can YOU Uncover the missing truth behind this mystery Doll??? Thrilled to know any info. found at all! 14.5 tall vinyl , blinking eyes & made in china on neck and back of her. SHE IS ABOUT 21" IF YOU MEASURE FROM HER FEET TO HER HEAD. NO CRIER. SHE IS SITTING BY THE SHAPE OF HER CLOTH BODY. I got this from a relative's estate, and I can't find any like it on eBay or the internet. It's about 5" tall and is marked Germany on the back. I have a few dolls i am just looking to find the value of? Anyone help please. How can I find out more about this doll... name? authentic? worth? etc. Thanks! Our neighbor gave this doll to my daughter about 15 years ago. Would like to know more about it. There is not many markings on it. I have 3 dolls which I don't know the names. But there's a number on 2 of them # 154 & # 161. I would like to know what they're worth. Here are the photos for the black baby doll with painted blue eyes. Thank you for your interest and comments. hoping someone might be able to tell me the maker of this very pale bisque head. More dolls from grandmother. Like I said there is a good size boxful. Any help would be much appreciated!